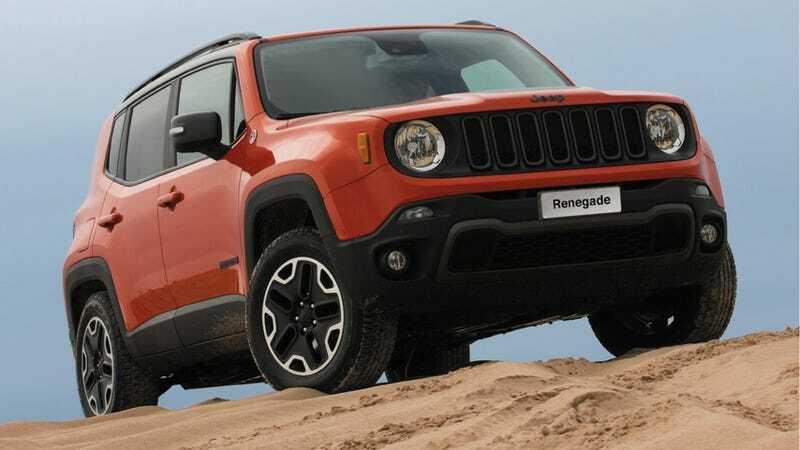 Looks like the 2015 Jeep Renegade's official price tag has leaked with the base Sport trim starting at $17,995 and the Trailhawk ringing up at $25,995 before options. 4WD is worth $2,000; that means you'll be able to get a three-pedal four-wheelin' version for just under twenty grand. The full options list is extensive, and will be posted soon as our own Damon Lavrinc has just driven the Renegade himself. No talk of diesel yet for the US market and no, you're not going to see a six-speed manual Trailhawk. But let's focus on the positive here; there's a new manual-shift 4WD offering and it's cheap as chips! I'm suddenly a little less sullen about the departure of the base Nissan Juke dropping its three-pedal configuration... there's hope for the super-small SUV segment yet!